One thing you notice in Kona is that some companies go out of their way to support their customers. Lately the bigger names in the bike world are notable by their absence, Cervelo being the exception. Several smaller brands also work hard to make sure their customers are taken care of led by Ventum. Ceepo is another. 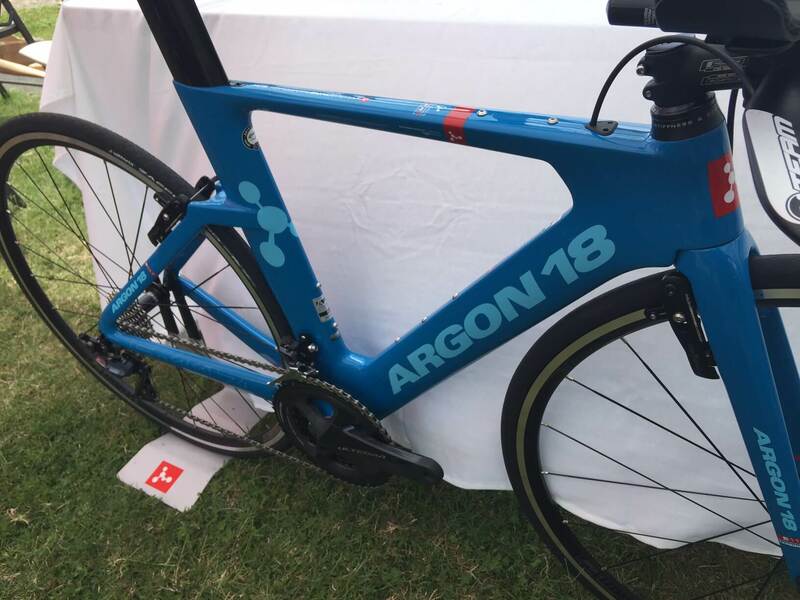 Argon 18 continues to be a standout, as they have here for years, with their own team of mechanics toiling all week in the Kona heat. You have never seen more Argon 18s, Ceepos or Ventums than you will see here, so maybe this matters. Better yet, Argon 18 threw a barbecue for all riders and dealers, featuring a Q&A with 3-time Kona champion and Argon 18 athlete Craig Alexander. Crowie dished out some valuable tips worth considering for any Ironman competitor, so here I will attempt to summarize his sage advice. Training and ageing: Crowie is 44 now but still slugs it out with the big boys a few times a year. For maintenance he likes to train 10-15 hours/week. But any of the top guys are going 30+/week (as he did in his younger days) so he does a 4-week build into race day of 20+ hour weeks. But the focus as you get older should be on strength and speed, and he also mentioned biomechanics. You have a lot of miles and hours under your belt, more won’t help you go faster. Focus on proper strength, speed and mobility work will. I believe this is also one of Lisbeth’s “secrets” as her coach Al Lyman puts a premium on this kind of work. 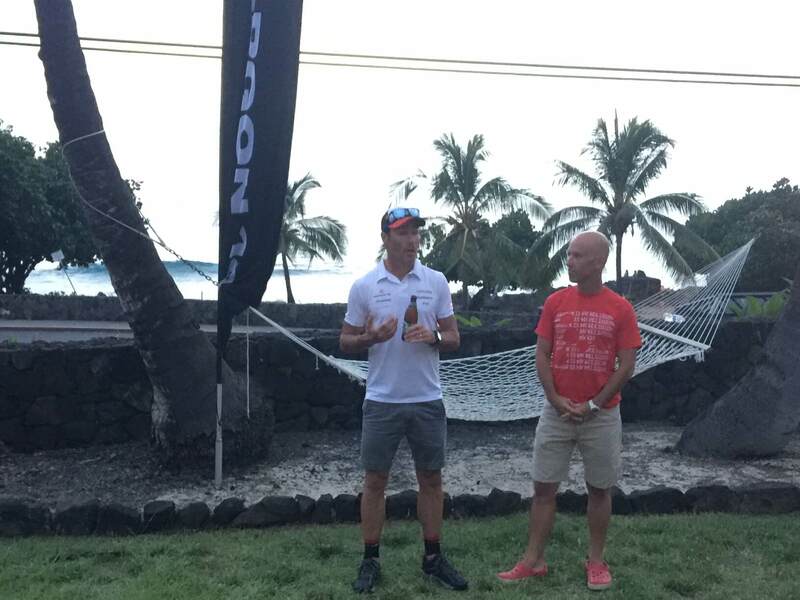 So here you have two multiple-time Kona winners giving you this advice. Maybe there is something to it? Yet, every day in the fit studio I see folks with terrible mobility and compromised strength who believe that doing more hours will make them better. It doesn’t need to take you more than maybe 45 minutes a week to make great gains here, but you need guidance. If you can barely lift your leg over your $10000 bike, as I saw yesterday, you are certainly not getting the full benefit of that $10k. The Bike: If you want to win (or qualify) you need to focus on bike fit and aerodynamics. As he said, there are 10-15 minutes of free (for your legs anyway) time to be gained, and he is not willing to give that up to anyone. Guys like Seb and Frodo focus on this stuff all year long with great attention to detail. He even mentioned switching to glued versus stitched seams on tri suits. Beyond having a well-designed bike that fits you (Crowie rides an Argon 18 E-119+), everything from helmet choice to suit choice to fit parameters is extremely important. You must get a good bike fit, and from there drill down on the aero details (this is Crowie talking – not me although of course I agree). This may mean a trip to the wind tunnel or track. But then again, maybe not as Argon 18 and Notio Konect are releasing a device which essentially serves as a portable wind tunnel, providing the rider with real time CdA measurements on the road. Clearly this could be a revolutionary technology and we will be sure to have one once they become available. Ironman Race Nutrition: He didn’t like to take in anything solid on race day – even for breakfast. However, Dave Scott did say he should consider solids later in the race including some protein. But although he would have a set plan, he would also be ready to address any problems and changing conditions that might arise. If you are getting irritable and the rest of the competitors are starting to piss you off, you are probably low on calories (or maybe you are just at a flat Ironman where everyone is drafting). He noted if the wind really cranked on the bike, he might need to up his calorie intake. The good news is in this state the body can quickly absorb any input to bring you back. If your stomach feels bloated and you still feel weak and irritable, you may be failing to absorb the calories you are consuming. Your stomach contents are too concentrated and the stuff just sits there. Dilute it with water and get it absorbed, stop taking in calories. I would say the one exception to this is if you have consumed too much water – hyponatremia and your belly is bloated with water – a potentially dangerous situation. Crowie remembered one year where he came out of the swim having swallowed much seawater. He felt ill and didn’t want his regular calories. In these situations, sodium and caffeine would help calm his stomach and get things assimilating once again, so Coke was the ticket back to normal. For sodium, he would target 800-1000 mg/hour. So that would often mean taking two salt stick capsules along with the 400+ mg he might get from sports drink. As he said he felt like you can’t really overdose on sodium so better to err high. Race week prep: Don’t do anything unusual. Seems painfully obvious, but many screw this one up. If you drink beer in training, have a couple during race week – my favorite tip. Don’t change anything on your bike, shoes, etc. He believes a taper should be just that – not a training cliff where you go from 30 hours (if a pro) to 3. He never went faster than IM pace during race week but emphasized keeping the plumbing working and well-oiled so to speak. But then again, everyone is different and needs to find what routine works well for them and stick to it. Race day psychology: He would expect the worst. For Kona he would assume the hottest and windiest conditions possible. But to the extent the conditions weren’t worst-case, that was a bonus. And he accepted that he would feel very bad at times even if having a great race. He mentioned that Mark Allen told him that during every Kona he won, there was at least one portion of the race where he felt like he wouldn’t be able to finish. Expect it, make good decisions about pacing (don’t chase Frodo if he flies by you on the bike unless that is part of a well thought out and appropriate race plan) and nutrition, and it will pass. So, there you have everything I can remember from Crowie’s Q and A courtesy of Argon 18. Might be easier if I take notes next time. You have undoubtedly heard some of this stuff before, but in that case you must ask yourself if that is because it is super important, and whether or not you are truly following it. Lone Star Adventures: Lisbeth’s Ironman Texas 2016 Race Report	How Fast Was Kona 2018 vs Historical Averages?